​The IEM Katowice Major New Challengers Stage opening matches were announced Wednesday. IEM also detailed the ranking system for the first round of the CS:GO Major. 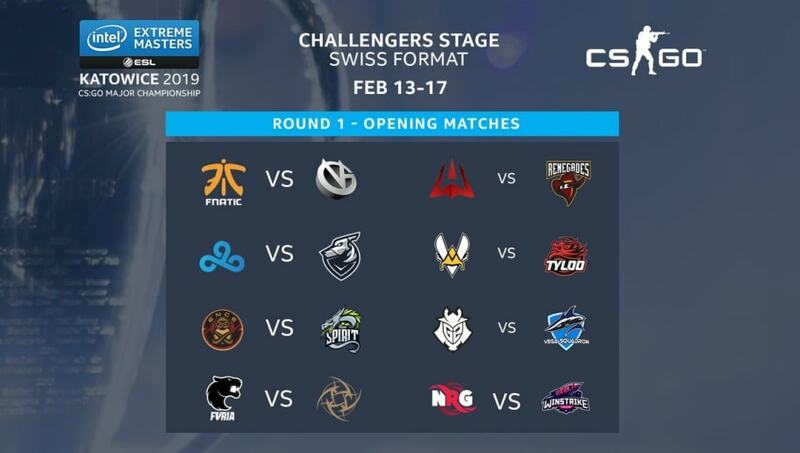 The first ​CS:GO Major of the year features a new seeding system, outlined by ​IEM in the match announcement. "...this year’s IEM Katowice Major will introduce a crowdsourced initial seeding system with each participating team ranking their 15 rivals. We then tallied the results, discarded votes that fell too far outside the expected range of the spread, and assigned each team an average ranking. The no. 1 seed got paired with no. 16, no. 2 with no. 15 and so on…," IEM said in the announcement. For more information on how the teams were seeding, head to ​IEM's announcement for details.